Yes, I know, they don't really stick their heads in the sand. But the South African government does on a regular basis. The xenophobia violence of earlier this year caused the violent deaths of 62 people (among them 21 South African citizens), displacement of and suffering for many thousands of people. People who were once friends, neighbours and colleagues were suddenly targeted by angry mobs. Some of the violence occurred only a few streets from where I live, and we feared for the safety of friends. Now the government has claimed that they have "done enough" for the victims of xenophobia and are forcing them to either go back to the communities where they were attacked, or the countries they fled. Unfortunately, most of these people no longer have homes - many of them lived in informal settlements and their "houses" and possessions were looted and sold as scrap by their erstwhile neighbours. What I consider to be some of the underlying issues - poverty, disillusionment, and a sense of being disempowered - have by no means been addressed. So what does our government think will happen when these traumatised, now destitute, people are forced to return to hostile communities? 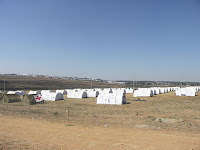 Blithely disregarding these questions, however, the government started dismantling camps three days before today's deadline, despite - or perhaps in response to - an application by The Consortium for Refugees and Migrants in South Africa and the Wits Law Clinic to keep the camps open for two months. There is no reintegration plan, no provision at all for their future. They are supposed to go back to places where many of their fellow foreigners had been attacked, raped and murdered. Those who don't leave the camps will be considered trespassers and dealt with as such by our merciful government. I shall be keeping an eye on the situation, and will post more information as the situation unfolds. Please spare a thought for the people returning to possible violence and certain misery, and for a once-promising Rainbow Nation gone horribly wrong.